The Binding Station 4-in-1 offers coil, wire, and plastic comb binding in one space saving unit. The EC-14 Electric Wire Closer offers the least expensive electric closer on the market today and two new desktop creasers designed to prevent cracking in digital prints. The Spiral/JB USA Binding Station 4-in-1 is a heavy duty punch and binding system that offers a unique space saving design; punch and bind Plastic Comb, Plastic Coil and Wire-O. The Binding Station 4 -in-1 has 4 different punching dies and 3 binding stations all in one compact design eliminating the need for interchangeable dies and numerous binding modules. The pin design can be fully disengaged which allows for punching on any size document up to 12″ and offers punching up to 35 sheets. The all metal construction makes it durable. The Spiral/JB USA EC-14 Electric Wire Closer is an affordable electric wire closer that will handle wire sizes from 3/16″ to 1-1/4″ and binding edges up to 14″ length. Adjusting for different size wires is easy and offers perfectly closed wire. The all metal construction makes it durable. Engineered for operator safety, the operator must use two hands to activate the electric closer. The Spiral/JB USA ProCrease-E Plus Creasing & Perfing Machine is an electric creasing and perforating machine. Designed to prevent cracking in toner based digitally printed graphics, the ProCrease-E Plus offers U shaped channel creasing dies. Change out the tool in the unit for adding perforations to your finishing projects as well. 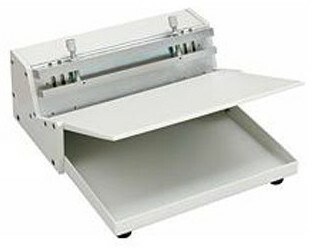 Electric operation with foot pedal activation for hands free operation and an 18″ width will provide creasing and perfing on 12″ x 18″ sheets in either direction. The ergonomically designed unit offers integrated die storage and built in handles to easily move the unit around the shop. The Spiral/JB USA Procrease-M is the little brother of the ProCrease-E Plus. 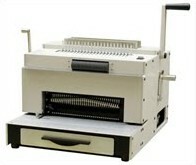 This manual channel creasing machine is designed to prevent cracking in toner based digitally printed graphics. It features all metal construction, magnetic paper stops assure exact position of each crease location on repetitive jobs, and a creasing width of 12 1/2″. All at a price that is unmatched in the industry.